For other places with the same name, see Newhaven. It lies at the mouth of the River Ouse, which has historically migrated westward from Seaford, one of the Cinque Ports. After a breakwater was built at the village of Meeching, and a new outlet cut through the valley, the railway reached the port in 1847, enabling a train-ferry, which brought great activity. The area then became known as the 'new haven', officially recognised as 'The Port of Newhaven' in 1882. Newhaven lies at the mouth of the River Ouse, in the valley the river has cut through the South Downs. Over the centuries the river has migrated between Newhaven and Seaford in response to the growth and decay of a shingle spit (shoal) at its mouth. There was a Bronze Age fort on what is now Castle Hill. In about 480 AD, the Saxon people established a village near where Newhaven now stands, which they named "Meeching" (variously known as "Myching" or "Mitching"). Throughout the Middle Ages, the main outlet and port of the Ouse was at Seaford (one of the Cinque Ports). The growth of the shingle spit hindered the outflow of the river, which consequently flooded the Levels upstream and hindered access to the port. Therefore, a channel through the shingle spit was cut in the mid-16th century below Castle Hill, creating access to a sheltered harbour, better than that at Seaford. This was the origin of modern Newhaven. However, shingle continued to accumulate and so the mouth of the Ouse began to migrate eastwards again. Under the Ouse Navigation Act (1790), a western breakwater was constructed to arrest longshore drift and so cut off the supply of shingle to the spit. A new outlet (The Cut) was built on the river's present course, below Castle Hill. At that time the settlement began to be known as the "new haven". The present breakwater was built in 1890. It was part of the Holmstrow hundred until the abolition of hundreds in the 19th century. Although there are some signs of the derelict facilities that serviced the former train ferry operations, the port still sees a great deal of freight and passengers movement. International ferries run to the French port of Dieppe, Seine-Maritime, operated by DFDS Seaways. There are two outbound sailings per day, one in the morning and one in the evening, using the 18,654 GT ro-ro ferry MS Côte D'Albâtre. Rail passengers wishing to connect with the ferries are advised nationally to travel to Newhaven Town, and then use the free bus service; this has resulted in a dramatic fall in passenger services at Newhaven Harbour, leading to questions regarding its future and that of Newhaven Marine. The port is the proposed main landside site for E.ON's development of the offshore-Rampion Wind Farm. The village was of little maritime importance until the opening of the railway line to Lewes in 1847. In 1848, the exiled French King Louis Philippe I landed here in disguise after abdicating his throne. The London Brighton and South Coast Railway (LB&SCR) constructed their own wharf and facilities on the east side of the river, and opened the Newhaven harbour railway station. The railway also funded the dredging of the channel and other improvements to the harbour between 1850 and 1878, to enable it to be used by cross channel ferries, and in 1863 the LB&SCR and the Chemin de Fer de l'Ouest introduced the Newhaven-Dieppe passenger service. The harbour was officially recognised as 'The Port of Newhaven' in 1882. Imports then included French farm products and manufactures, timber, granite and slates. Newhaven harbour was designated as the principal port for the movement of men and materiel to the European continent during World War I and was taken over by the military authorities and the ferries requisitioned for the duration of the war. Between 22 September 1916 and 2 December 1918, the port and town of Newhaven were designated a 'Special Military Area' under the 'Defence of the Realm Regulations', and the Harbour station was closed to the public. The port and harbour facilities, rail sidings and warehousing were greatly enlarged at this time and electric lighting installed to allow for 24-hour operation. During World War II, large numbers of Canadian troops were stationed at Newhaven, and the ill-fated Dieppe Raid in 1942 was largely launched from the harbour. The Newhaven Lifeboat, the first of which was commissioned in 1803, is among the oldest in Britain, and was established some 20 years before the Royal National Lifeboat Institution. The town established the rescue lifeboat in response to the wreck of HMS Brazen in January 1800 when only one man of her crew of some 105 men could be saved. The town used a combination of funds raised locally and contributed by Lloyd's of London to purchase a lifeboat built to Henry Greathead's "Original" design. Newhaven also has one of the Watch stations of the National Coastwatch Institution. To the east, in the neighbouring parish of Seaford was the village of Tide Mills, built in 1761, and now derelict. Here are the remains of workers' cottages, the tide mill itself, and a large saline lagoon which was the storage pond for high water to power the mills on the outgoing tide. The Newhaven Marconi Radio Station was established in 1904, and started running in 1905. The station was owned and operated by the Marconi Radio Company and achieved regular ship to shore radio communications in approximately 1912. To the east of Newhaven is the 50,000-foot production factory of King and McGaw, the UK's largest online Art provider. The company employs around 70 people and its contribution to the area was recognised in April 2014 with a visit from local MP Norman Baker. The Heritage Marine Hospital was built in 1924 to cater for disabled boys who had undergone surgery. It became a casualty of wartime defence work during World War II. The Denton Island Business Park lies to the north of the town on the west bank of the river. The business park has attracted a number of businesses to the area with the basepoint Newhaven Enterprise Centre being the focal point. The centre has attracted a lot of new businesses to the area. A new waste incinerator, just across from Denton Island, was completed in late 2011 and is now in full operation, despite huge opposition by local residents from across the Lewes District. Newhaven Fort, one of the Palmerston Forts, was built on Castle Hill on the recommendation of the 1859 Royal Commission to defend the growing harbour. It was the largest defence work ever built in Sussex and is now open as a museum. The adjacent village of Tide Mills was the site of an experimental seaplane base at the head of the beach. The first formation of No. 242 Squadron RAF was on 15 August 1918 from numbers 408, 409 and 514 Flights at the seaplane station at Newhaven, Sussex. Operating from there and the nearby airfield at Telscombe Cliffs, it was equipped with Short Type 184 seaplanes and carried out anti-submarine patrols over the English Channel until the end of the First World War. Surveys carried out in 2006 have exposed part of the slipway, concrete aprons to both hangars with door tracks and several other slabs presumed to be workshops. Sussex Archaeological Society started a dig in April 2006 to catalogue the entire East Beach site. The main part of the town is located on the west side of the river, there is also a residential area at Denton and Mount Pleasant on the slopes of the Downs to the east. Industrial areas lay on the east side of the river as do all three of the railway stations which serve Newhaven; Newhaven Town, Newhaven Harbour and the now redundant Newhaven Marine. Recent housing development has taken place at the West Quay, Harbour Heights and August Fields. Newhaven Town Council was formed in 1974. There are 18 councillors representing three wards: Denton ward (five councillors); Meeching (seven); and Valley (six). The parliamentary constituency for Newhaven is Lewes. The Liberal Democrat Norman Baker served as the constituency member of parliament from 1997 until 2015, when Conservative Maria Caulfield was elected. 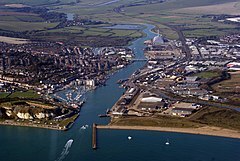 At European level, Newhaven is represented by the South-East region, which holds ten seats in the European Parliament. The June 2014 election returned 3 Conservatives, 1 Liberal Democrat, 4 UK Independence, 1 Labour and 1 Green, none of whom live in East Sussex. Newhaven population (12,232 persons) are 59% of working age; 22% are 15 and under; and 19% retirement age. There are over 360 businesses in the town. Unemployment (higher than the South-east average) was at 2.4% in 2008. The main landmark in the town is the Newhaven Fort. The new waste incinerator is a major landmark, the chimney being visible from the sea as well as from Firle Beacon and parts of Seaford. The parish includes part of the Brighton to Newhaven Cliffs Site of Special Scientific Interest. The cliffs are mainly of geological interest, containing many Santonian and Campanian fossils. The SSSI listing includes flora and fauna biological interest too. The open land surrounding Newhaven to the west, north and east is part of the South Downs National Park, although the town itself is excluded from the boundaries. Newhaven is also the site of a planned memorial bench for deceased American rapper Eazy-E.
Newhaven lies at the southern end of the cross-country A26 trunk road originating in Maidstone; and its junction with the A259 coast road between Brighton and Eastbourne. It is also located on the Seaford Branch Line from Lewes; there are two operating stations: Newhaven Town and Newhaven Harbour. A third, for all intents and purposes unused since its train ferry services ceased using it, was Newhaven Marine railway station. Walkers on the long-distance footpath, the Vanguard Way end their journey here from East Croydon in south London. There are two secondary schools in the town: Seahaven Academy (previously known as Tideway Comprehensive), and UTC@Harbourside which opened in Newhaven in September 2014 for 14- to 18-year-olds. There are four primary schools: Denton Community Primary, Meeching Valley, Harbour Primary School and Newhaven Academy which opened in September 2015 in brand-new buildings in Southdown Road, on what was part of the Tideway Comprehensive School site. The Newhaven Local & Maritime Museum is operated by the Newhaven Historical Society and is a registered charity. The Planet Earth Museum and Sussex History Trail is dedicated to the history of the earth. They are both located at Paradise Park which is a garden centre owned by the Tate family. The parish church is dedicated to St Michael and is shared by the Church of England and Methodist communities. The Roman Catholic church is dedicated to the Sacred Heart (Church of the Sacred Heart). The town is featured in Crime Is My Business by W. Howard Baker (Sexton Blake Library No 408, Amalgamated Press, 1958) and possibly based on an idea or material by Jack Trevor Story. 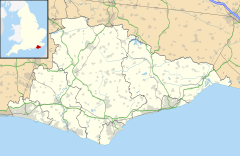 Although mentioned (along with Brighton, Beachy Head, and Eastbourne), the references are vague and one would not recognise the town from the book. Other references in the text (a typical Sexton Blake adventure) suggest a roadside café somewhere in the region of the recently demolished Peacehaven Motel, which was formerly situated at the eastern end of Peacehaven. The town is officially twinned with La Chapelle-Saint-Mesmin (La Chapelle-Saint-Mesmin-french) in France (near Orléans) since 2011 (13 November) and 2012 (28 January 28), the official Twinning Charter signing dates which took place in Newhaven and in La Chapelle Saint-Mesmin with both Mayors and Chairmen of the Comité de Jumelage Chapellois and the Newhaven Twinning Association. Newhaven is home to a thriving marina: the Newhaven and Seaford Sailing Club is based there; scuba diving, water skiing and surfboarding are also practised. Newhaven Football Club plays in the Sussex County League; there is a thriving archery club. The town also boasts a large and modern indoor bowls centre, and there is a thriving outdoor bowling green located close to the marina. Ho Chi Minh in 1913. When he was a pastry boy on the Newhaven–Dieppe ferry route. ^ "Town population 2011". Retrieved 12 October 2015. ^ a b "Parishes: Newhaven - British History Online". www.british-history.ac.uk. ^ Brandon, P. and Short, B., 1990: The South-East from AD 1000. Longman. ^ Woodcock, A., 2003: The archaeological implications of coastal change in Sussex. pp1-16 in Rudling, D., (ed. ), The Archaeology of Sussex to AD2000. Heritage, University of Sussex. ^ Parliamentary Papers, House of Commons and Command, Volume 11. H M Stationery Office. 1831. ^ "Newhaven Harbour Pictures". www.mainlymono.co.uk. ^ "Newhaven Ferry. Compare Prices, Times & Book Cheap Tickets". www.aferry.co.uk. ^ "Newhaven Port reveals how the Rampion wind farm will help secure its future". Sussex Express. 12 October 2012. Retrieved 10 February 2013. ^ "Ho Chi Minh and other notables in Newhaven". The Independent. 5 April 2015. Retrieved 7 December 2017. ^ Pratt, Edwin (1921). British railways and the Great War. Selwyn & Blount. OCLC 1850596. p.1032-3. ^ Jordan, S (1998). Ferry Services of the London, Brighton & South Coast Railway. Usk: The Oakwood Press. ISBN 0-85361-521-7. ^ The Official Guide to the London Brighton and South Coast Railway. Cassell. 1912. pp. 260–2. ^ Official Guide to the London Brighton and South Coast Railway, (1912) 260-2. ^ Eastbourne and Beachy Head (Map) (B2 ed.). 1:25 000. OS Explorer Map. Ordnance Survey. 2009. ISBN 978-0-319-24082-3. ^ Pratt, British railways and the Great War, p.1033. ^ "Welcome To Newhaven Lifeboat". www.newhavenlifeboat.co.uk. ^ "James Bidwell appointed CEO of Easyart as fast growing online art company secures additional funding round". ^ "Delight about Easyart being based in Newhaven". Sussex Express. 27 April 2014. Retrieved 13 June 2018. ^ "Home - Newhaven Fort". Newhaven Fort. ^ "UK MEP's". UK Office of the European Parliament. Archived from the original on 17 September 2007. Retrieved 19 September 2007. ^ "Natural England – SSSI". English Nature. Retrieved 19 June 2008. ^ "abandonedplaces: Newhaven Marine railway station". 13 July 2012. Archived from the original on 13 July 2012. ^ "Seahaven Academy > Home". www.seahavenacademy.org.uk. ^ Team, Web. "primary school search results for 'newhaven' – East Sussex County Council". www.eastsussex.gov.uk. ^ "Paradise Park, Newhaven". Britain's Finest. ^ "Paradise Park Homepage - Paradise Park". Paradise Park. ^ "St Michael's Church, Newhaven, Sussex, England - 2nd January 2004". www.roughwood.net. ^ "Serment de jumelage - Comité de Jumelage de La Chapelle Saint-Mesmin (45)". sites.google.com. ^ "Newhaven Archery Club". www.newhavenarcheryclub.co.uk. ^ Harries, David. "Maritime Sussex". Sussex Express. Retrieved 12 June 2015. Wikivoyage has a travel guide for Newhaven. Wikimedia Commons has media related to Newhaven, East Sussex. Wikisource has the text of the 1905 New International Encyclopedia article Newhaven.